The bell tower as a symbol of rejuvenation and change is nothing new. When it was first created back in 1984 that's exactly what it meant to be. Here's a look back at the tower and the very historic bell that's likely two decades older than the record states ! The money went to everything from exterior fix-up grants for landlords to the widening of sidewalks and the replacement of street furniture such as benches, light standards and planters. The most ambitious project, though, was Selkirk Square. Selkirk Square required closing off Powers Street at Selkirk Avenue (Google map) and created a pedestrian plaza area. The south side of Selkirk became an amphitheatre and seating area while the north side featured a bell tower to act as a landmark and meeting place. It's one thing to build a bell tower but another to find a large bell lying around to use in it. Planners went on a hunt that ended in the basement of the Museum of Man and Nature (no Manitoba Museum) where one of the most important bells in the city's history was in storage. 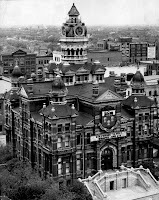 Newspaper accounts from the time said that the bell was cast in 1889 and installed in Winnipeg's City Hall (number 2), the Gingerbread House. That is only partly true. When I looked back to find a story about the bell's installation there were none. This is odd considering that any small town or church getting a new bell made the newspapers. 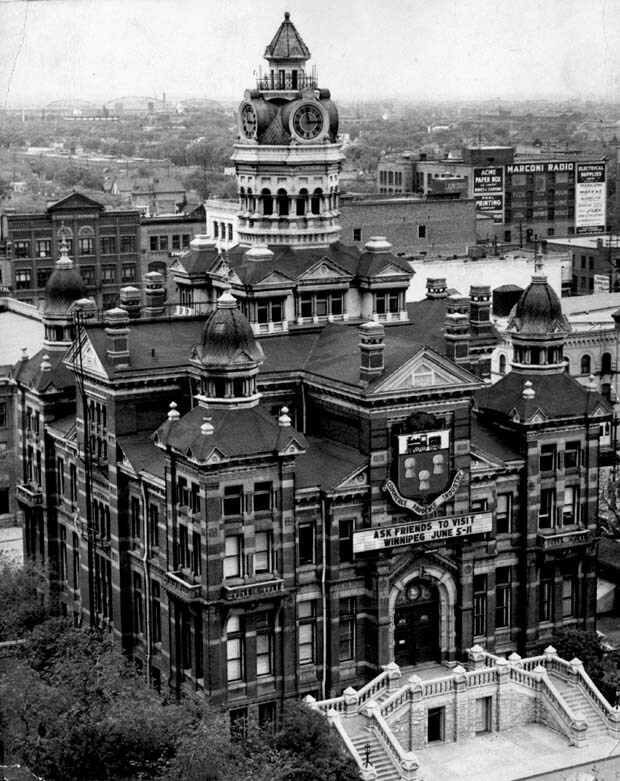 City Hall was built in 1886 so installing a 1,600 lb bell into the tower three years later would have required some very conspicuous work to be done. I dug back further into the news archives and found that this is actually the city bell from 1877. A city bell acted first and foremost as a fire alarm. Winnipeg did not get a full-time fire brigade until 1882 so it relied on volunteers, property owners and the public to be alert and to help save lives, livestock and property. The city did have a fire bell of some sort previous to this but in May 1877 council passed a resolution for the clerk to order from St. Paul, Minneapolis a 1,200 lb fire bell that cost no more than $220. On June 23 1877 a 1,600 lb bronze bell cast by Meneely and Kimberly of Troy, N.Y. arrived aboard the steamship International. 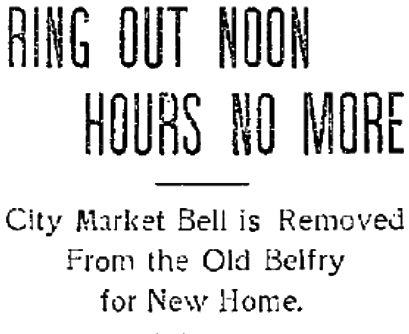 The bell was first installed in the Market Building behind city hall and used for much more than fires. For over two decades it rang at noon time, fifteen minutes before stores closed (on weekdays by 7 pm for dry goods merchants and 8 pm for grocers, Saturdays at 6 pm for everyone), and fifteen minutes before school started. There were also special occasions such as when the funeral corteges of prominent citizens passed city hall on the way to or from the train station and when political figures (like John A. McDonald) died. There was even an official bell ringer ! The first was Harry Kirk, a jack-of-all-trades at city hall (caretaker, repairman, gardener, security guard) and a cleaner at the Market Building. He had to live on-site 24/7 so was given the responsibility of making sure that the the bell rang on time. 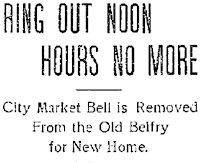 In 1889 the bell was removed when the Market Building was being rebuilt but re-installed afterwards, which is likely why 1889 is said to be the year it first arrived, but it was the same, old bell. The bell was seldom rung from its new location as someone had to climb the 150 - 200 steps to the tower to ring it.The idea of an electric bell-ringing switch was considered in 1903 but I can't find any evidence that one was ever installed. When city hall was demolished in 1961 - 62 the rickety dome was the first thing to go. The bell was saved and ended up at in storage at the museum. The clock mechanism was saved and after decades in storage was installed in Edmonton Court at Portage Place. 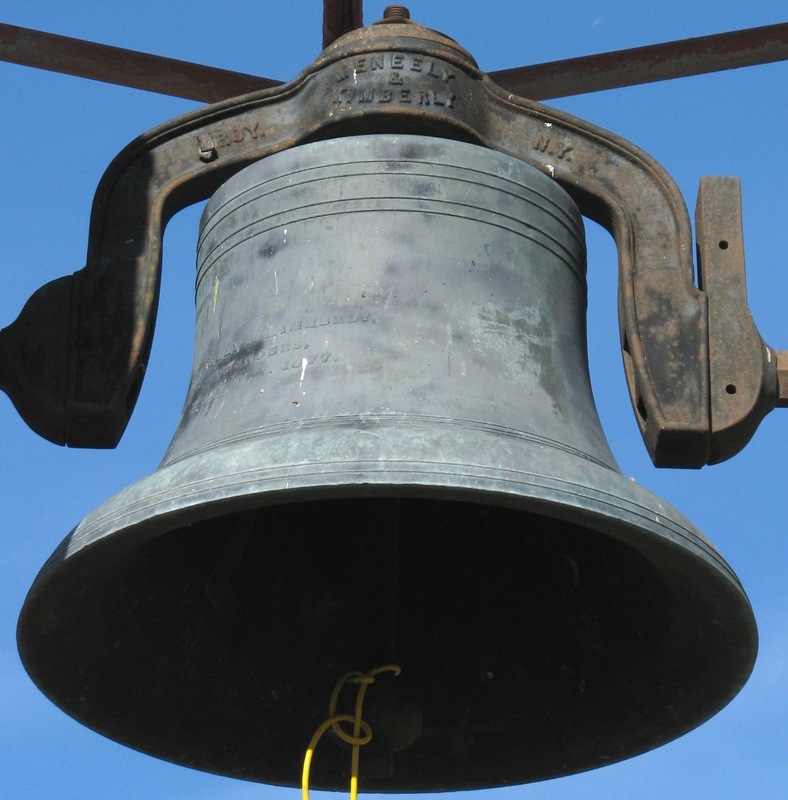 Back on Selkirk Avenue, the bell was installed into the new bell tower and on Friday June 21, 1985 Don Durchak, 86, who lived in the adjacent seniors housing tower at 145 Powers Street, rang it to signal the opening of Selkirk Square. The Selkirk Avenue Business Association (SABA) sponsored Friday farmers markets and weekend events such as walking tours and concerts at Selkirk Square until 1991. In 2010 the city put out a tender to have the farmers market / amphitheatre structures demolished in order to eliminate blind corners and to prepare the area for a new bike / pedestrian path. that market/city hall photo always makes me puke a little bit in my mouth....cant imagine watching it be demolished. nice article in the WFP too. Thanks on both accounts ! I read through a lot of articles about the end of city hall 2's life to find out about the bell and the lack of any sentiment toward the building, market and the entire square block of buildings to the north was surprising, even by Winnipeg standards. Almost a celebration.